Jiří Orten Grammar School is located in a quiet residential area in the southwest of the town, near St Barbara’s Cathedral. It is 1 kilometre from the town centre – Palackého Square. Though having one of the most modern school buildings in the country, Jiří Orten High School has a long tradition. A school of a similar kind existed in Kutná Hora as early as the 16th century, this was followed by a Jesuit High School. After the Jesuit Order had been suppressed, this school was replaced with the so called “c. k. main school” situated in the Little Castle (today’s Museum of Silver). In 1857, the direct predecessor of Jiří Orten High School was founded. It was called the Higher Grammar School and it was in a new building in Komenský Square. Josef Mazač became the first headmaster. In 1862 a new headmaster Josef Webr came into office and introduced Czech as the official teaching language. The year 1869 brought another milestone as school leaving exams (known as “maturita” in Czech) were held for the first time. Since 1876 the school has been publishing its annual reports, although there have been several interruptions caused by political situations. As the school grew, the building in Komenský Square could not cope with the increasing number of students. On the 9th October 1894 headmaster Dr Jan Plašil asked the town council to consider either the enlargement of the school building or the construction of a new one. The council chose the latter option. The new building was designed by architect Otakar Materna and built opposite St Barbara’s Cathedral between the years 1898 and 1900. On the 18th of September 1900 it welcomed its first students. In the early 1900s girls were allowed to study at this school for the first time. Shortly after the beginning of WW I the school building was confiscated by the Austrian-Hungarian Army, which used it until the end of the war. In 1934 the name was changed to the Czechoslovak State High School. WW II also saw some confiscations: first by the German Army, then by the Red Army. Eventually teaching resumed in September 1945. In 1948 the Communists seized power in Czechoslovakia. Consequently, in 1953 high schools were cancelled and replaced with “eleven-year secondary schools”, according to the USSR model. Other changes of names and school systems followed. Even in those difficult times the school managed to keep its standards. In the late 1960s the state handed the building over to the municipality of Kutná Hora, which decided to locate a primary school in it. The two schools then had to share the premises, which were becoming more and more insufficient. In 1989 the political climate in Central and Eastern Europe finally changed. The Communist regime collapsed and the country set off for democracy and market economy. This was reflected in education too, as foreign languages have been the key subjects since then. In 1990 Dr. Vladislav Slavíček was elected the headmaster and he has been in office to the present time. The eight-year course of studies was re-established the same year. The annual reports started to be published again and a school magazine, library and drama group were established. A new building turned out to be a must. It was designed by architect Radim Bárta and in 1994 its construction started on the former AFK Respo football ground. The costs totaled nearly 144 million CZK (5.76 million USD) and were covered by the Ministry of Education. The new school building opened on the 1st of September 1997. There are 29 classrooms in the school building. 18 of are equipped for 34 pupils, while 11 “small” classrooms are used especially for language teaching. All the classrooms are equipped with an overhead or film projector, 13 of them with an interactive board. All computers in the classrooms are connected to the Internet. 19 computers are at our student’s free disposal in an open multimedia classroom. Here they can search for information for their classes, surf on the Net or send and receive their private emails. The classroom is available daily till 5 pm but on Fridays only till 3 pm. Specialised classrooms are equipped with further teaching equipment. Chemistry and Physics Labs serve for laboratory exercises. Information Technology is taught in two computer classrooms. A new computer classroom for other subjects is going to be built in the near future. Its capacity should be sufficient for one complete class of 35 students. The students can connect their own laptops on the local wi-fi network in all premises of the school. Teachers take great care of their classrooms and create the unique and highly motivating character of our school. Jiří Orten Grammar School is a school which provides general education completed with school-leaving exams. 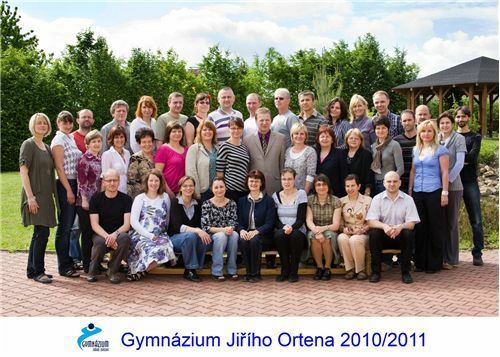 The staff of our school consists of about 40 teachers. The average age is about forty in spite of changes that occur. On average they have been teaching for about sixteen years. The percentage of men has traditionally been high, and usually represents over one-third of our staff. There are also two qualified educational counsellors working at our school. Our teachers are in charge of the following clubs: choir, martial arts, sports and games, training for language exams. The Student Parliament was founded in the school year 2006/07 to improve the awareness of our students about what is going on at our school. It is also a tool for open communication between students and school management. 3. Grammar schools in Kralupy nad Vltavou and Hradec Králové – cooperation in the field of project teaching. Jiří Orten Grammar School has two gyms, a fitness centre, a climbing wall in the assembly hall, and basketball and volleyball courts. A mini-arboretum is being built on the sloop at the west edge of the school grounds. Common Central European woody plants and their seasonal transformations (bark, buds, leaves, and blossoms) can be seen there. Shelters for small mammals, birds, reptiles and insects are also part of the mini-arboretum. Part of the green field behind the school has been transformed into a “Czech flower garden”. Other relaxation zone is the school garden with two small lakes (where you can find Japanese carps), and which is visited especially in warm seasons of the year. A nearby garden house is a place where classes can be held. In another part of the grounds there is a fireplace that serves for both pupils and staff. Sherwood is an important relaxation and educational zone of our school. Exhibits from the greenhouses are displayed there. A small exhibition gives the students and visitors an idea about Kutná Hora, its places of interest, mining, minting and historical importance. A mini ZOO located in the Biology labs amazes our visitors. We can see not only reptiles, but also frogs, small wild mammals, such as hamsters, and exotic insects. The assembly hall is the largest room in our school. It is used for gatherings on the occasion of the opening and closing of the school year as well as for cultural events. A climbing wall and a is also located here. Thus the assembly hall serves for both cultural and sport purposes. The musical classroom on the 2nd floor is another premise where cultural events can be held. The school greenhouse has been in use since September 2002. Its specialities are utilitarian plants of the tropical and subtropical zone, such as olive trees, pineapple plants, citron, taro, sugar cane, tobacco plants, coffee plants, ginger and others as well as ornamental plants such as bougainvillea, camellia, jacaranda, many kinds of orchids and others. There are also various rarities, for example grevillea, sequoia, moor pine and a lot of insectivorous plants. A permanent temperature of 12 C is kept in the greenhouse throughout winter. This enables us to succeed in growing plants which used to be grown by our grandmothers and great-grandmothers but which have nearly disappeared from Czech flats due to the introduction of central heating. These are for instance azalea, pelargonium, sowbreads, prymulas, and myrtles. The school has its own spacious library, which is open to students four days a week. All the information our visitors need can be obtained in the school office. Our school canteen provides food for 570 people every day. Lunch consists of soup, a main course and usually a dessert. Three times a week – from Tuesday to Thursday – there are two main courses to choose from. One of them is a vegetarian dish. The price of lunch is about 1 EUR. The opening hours are from 11 am to 2 pm every day. The school buffet provides catering during the day. It sells hot and cold drinks, sweets, pastry, sandwiches, hot dogs and basic student needs, such as pencils, pens, exercise books, and rulers. In the school there are three living room bedroom combinations where our guests or, in special cases, teachers can be accommodated. Each has its own shower cubical and toilet. A kitchenette is shared and equipped with an electric stove and cooking utensils.